There are moments in one’s life when destiny smiles in the face of adversity. 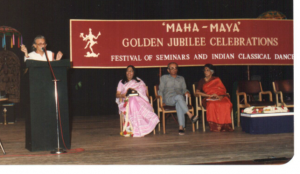 One such moment came in my life when I had an accident in1969, which left me with a permanent injury and brutally cut me off from performing Bharata Natya. 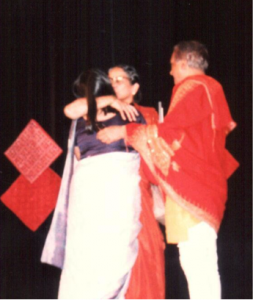 Some of my well-wishers helped me to overcome the initial shock and despair by encouraging, to the point of coaxing and goading me , to teaching Bharata Natya in Montreal. “What a formidable task to undertake” I thought at the time; but, as if by divine intervention, my gurus, U.S. Krishna Rao and U.K. Chandrabhaga Devi (Guruji and Amma to me) appeared on the horizon just when I needed them most, to provide guidance and inspiration and above all, to help regenerate my passion for dance. The Rao couple was on a visit to North America in the spring of 1980 and accepted an invitation from me to come to Montreal. They gave a scintillating lecture demonstration on Bharata Natya, organized by the India Canada Association of Montreal, to a packed auditorium of over 500 captivated listeners. On that occasion, not only did they enlighten the Montrealers present, on the intricacies and aesthetics of Bharata Natya, but also endorsed, with warmth and generosity of spirit, my humble efforts to start a dance school by agreeing to return to Montreal for an extended stay. It was a wonderful way to re-establish our contact and renew our ties which dated back to the late fifties when I had gone to Bangalore for advance training in Bharata Natya after having earlier studied the art in Patna from one of their disciples, Guru Balakrishnan. 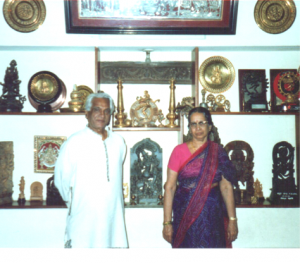 During this two-month stay, Guruji and Amma conducted special classes, in which they taught several items to the senior students of Kala Bharati. These items remain a valuable part of our present repertoire. 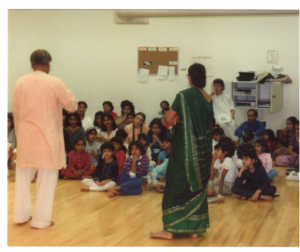 In 1985 Kala Bharati was once again privileged to welcome the Gurus to Montreal for a period of four weeks. This time they were accompanied by their grand daughter Anjali. In addition to the evening of lecture demonstration on the training of the Bharata Natya dancer, they gave special classes to the senior students of Kala Bharati, which enabled us to add some new items composed by them, to our repertoire. 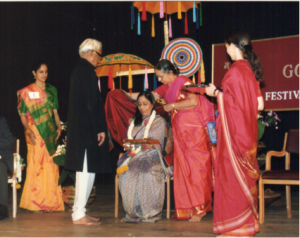 The contribution of the Raos to Kala Bharati has come full circle, so to say. In the initial stages, they were here to encourage and inspire us when the foundation was being laid. Their untiring work during the second visit strengthened the base of Kala Bharati and also helped and guided us in building a solid and credible structure. In 1985 their presence and contribution instilled a sense of confidence and was a sign of affirmation of faith in the work of Kala Bharati. What superlatives-what kudos and what acme of perfection - according to all the critics who have with ONE VOICE so to say praised the show to the skies. The capitalization and underlining of parts of her letter reflected Amma’s emotional involvement in sharing her “joy and fulfillment” at La Troupe’s success. Such expressions of love and warmth leave me humble with an overwhelming sense of gratitude, just as I was when I found that I was one of their two disciples, (the other being Guru T.S.Bhat of Bangalore) among a group of sixteen Gurus from different styles of Indian Classical dance forms they had chosen to honour on the occasion of their Golden Jubilee. There is no greater award for me to aspire for or treasure when my own Gurus have shown such faith and approval of my modest contribution to the art of Bharata Natya. “Oh, it is so wonderful, it must be seen by others here in India” spoke volumes for me. It was the last time I saw Amma in person. She passed away in April 1997. As if by Amma’s prophetic acclamation, Seasonscape was indeed seen by many in India. La Troupe Kala Bharati was invited by CPC Prashar Bharati to record one hour of my choreographies of Bharata Natya items as part of a weeklong music and dance special programme to be telecast as part of the closing ceremony of 50 years of Independence of India. In this connection it was first telecast on the 13th August 1998, and then chosen to be re-telecast on the 15th August, Independence Day, immediately following Prime Minister Bajpayee’s speech to the nation. 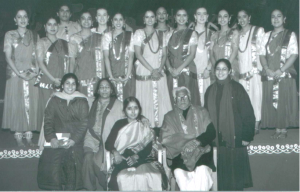 What made this event most memorable was the fact that Guru ji so very kindly agreed to my request to come over from Bangalore to New Delhi to be with La Troupe Kala Bharati at the end of December1997 while the recording was going on. It could not have been an easy decision as Amma had passed away just that year and travelling alone by himself must have put its own constraints; but Guru ji’s largesse of spirit prevailed and he joined us in sharing this unique experience. 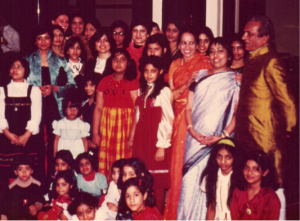 During the whole period, Guru ji stayed in the same premises as the members of the Troupe; attended some of the sessions at the recording studio; spoke enthusiastically about La Troupe at the reception at India International Centre, Delhi and celebrated his 85th birthday on the 31st December with us. Guru ji, as always, was a vibrant and uplifting presence throughout, exuding infectious joy and good humour. 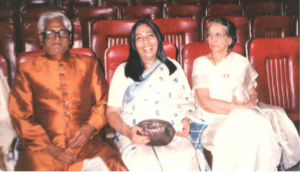 It was a happy coincidence that in the year 2002 , the year in which he celebrated his 90th birthday, Guru ji was the recipient of the Krishna Iyer award given by the Sruti Foundation for outstanding service to classical Indian dance. 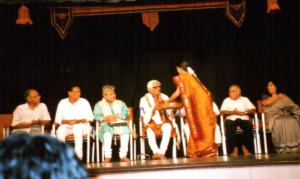 Dr.Pattabhi Raman, the founding editor of Sruti, called me from Chennai to inform me that I was one of the two disciples of Guru Krishna Rao he was planning to invite to speak at the award ceremony during the Music festival season in December. I was able to complete Shishu Sadhana on time and its publication coincided with Guru ji’s birthday on 31st December 2004. Shishu Sadhana, a book describing the creative process of a child-friendly Bharata Natya repertoire with a DVD containing the choreography of the items, has been dedicated to Guru ji and Amma as my ultimate homage to them. He received the very first copy of Shishu Sadhana at the end of Dec 2004 and was able to see the DVD on the 9th January, 2005. “ I was able to see the DVD in its entirety and I am happy I saw it. What you have attempted is a very new and perhaps an original concept. The repertoire is indeed quite innovative and covers the expanse of Bharata Natya, which holds unlimited potential to anyone who desires to compose and choreograph newer items in the styles propounded by our ancestors …..While the current trend among many dancers here in India is towards greater speed and attendant intricacies, you Mamata , have done quite the opposite and made it simpler with a tempo better suited to children of ages upto early teens. This is indeed a laudable effort….May Lord Nataraja bestow upon you His choicest blessings”. Two months after I received this positive feedback, Guru ji passed away on the 6th of March,2005 . I derive great solace from the fact that he had seen this DVD and sent me his blessings. It is difficult to accept that Guru ji and Amma are no more and we will not be able to call on them personally to have their physical presence amongst us. But how can our Gurus’ presence not be there always with us, in everything we try to do to carry on, given the rich heritage and legacy they have bequeathed us, their students? As Jules Renard has pointed out “The reward of great men is that, long after they have died, one is not quite sure that they are dead." This year being the centennial birth anniversary of Guru ji, we feel their presence among us, more than ever. I consider myself fortunate to have had Amma and Guru ji as my teachers, mentors and guides in my service to the art of Bharata Natya. Their blessings and warm appreciation for the work being done to continue their legacy at Kala Bharati, will always be a source of inspiration and encouragement for me.